For the last few months French workers have gone on strike and taken to the streets in demonstrations and street meetings against the new Labour Law. What is striking about the El Khomri law (so-called after the Minister for Labour), especially when compared to the rest of Europe, is not its content but the reaction that it has provoked amongst wide sectors of the working class and so-called "civil society", i.e. students and significant layers of the declining petty bourgeoisie which mainly began during the nightly meetings of "Nuit debout" [Up All Night]. Although starting life as a political initiative of radical reformism (Trotskyism, recycled Stalinism, "no-globals", pacifism, etc. ), thus with the widespread presence of the typical illusions of that environment, they cannot just be seen as the result of manoeuvres by reformists anxious to take to the political stage. 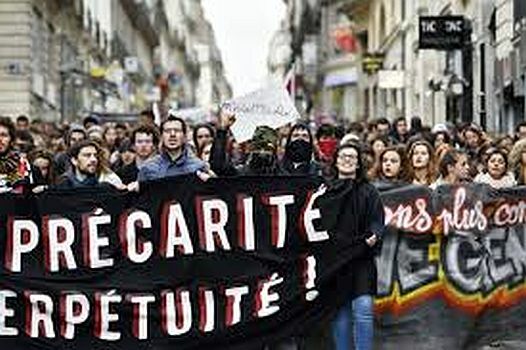 "Nuit debout", like the movements of the "squares" (Tahrir, Taksim etc) which have appeared in recent years (Greece, the Arab Spring, Spain ...), despite confusions and enormous political weakness, is clearly an expression of a deeper social malaise. It is an instinctive rejection of the way contemporary society basically operates. It is a reflection of the new composition of the working class forged in the upheavals produced by decades of crisis and restructuring. This is now a mixture of workers in the traditional manufacturing jobs with those in the service sector from shop workers to high tech employees. Alongside the casualisation of work which makes working conditions precarious and short-term (zero hour contracts etc.) we have also witnessed the “proletarianisation” of what were once considered “the professions” and the massive rise of graduate unemployment. Many workers have been forced (against their will) to become self-employed surviving on lower incomes than in their previous job whilst many in the traditional petty bourgeoisie are also facing “proletarianisation”. All have experienced worse living and working conditions (wages, hours, loss of employment "guarantees" or "rights") over the last 40 years and in particular in the last decade. This new generation of proletarians has found it more difficult than in the past to fight together as they are fragmented in smaller dispersed workplaces, often underpaid and constantly blackmailed by the threat of dismissal. This social composition, brought about by the changes in the economy as a whole, tends to express its discontent, its anger on the streets or in the "squares." This does not mean that workplaces (of all types) take second place or have lost their central strategic role in revolutionary class struggle. The workplace is where the lifeblood of capital, surplus value is extorted and this has not changed. In fact the political confusions of the street movements on the "squares" are due to the fact many of those joining the ranks of the proletariat do not yet recognise that fact. It is this condition of objective fragmentation of our class, together with the absence of a working class and revolutionary rallying point, which makes the revival of anti-capitalism so difficult. The countless changes in the organisation of production (and distribution), the frenzied attack of the bourgeoisie on the "old" and "new" working class, have gone in parallel with a systematic political and ideological campaign aimed at presenting the collapse of the former USSR, which had nothing to do with socialism as the end of all hope for a different and better world under the name of communism. The USSR previously like China today was only a form of state capitalism. Even so, the "new" proletarians find it hard to perceive of themselves as working class. Instead of opposing their irreconcilable interests to capitalist society itself, a society which cannot be reformed, but only destroyed, they only oppose this or that aspect of bourgeois society (the dominance of finance, the various forms of "social injustice," gender oppression, devastation of the natural environment, wars etc.). In these circumstances you feel the need for some centre of class attraction, a revolutionary party, to organise and give direction to this profound social discontent against capitalism in order to overthrow it. Without it, once again, any expression of protest or social revolt is inevitably reabsorbed or defeated by the system; and it is a sterile defeat, from which the proletariat cannot draw lessons for the future resumption of its struggle against capital, whilst capital continues to advance like a steamroller over the working class as a whole. In fact, the "Labour Law" does not differ, in substance and often in specific measures from what governments of all political stripes have implemented across Europe (to remain in the old continent) for at least a quarter of a century. It is, of course, all about making the labour force more "flexible", more "productive" for the needs of every firm (private or "public"), to eliminate as far as possible any obstacle to the extortion of increasing amounts of surplus value. Put another way, laws from a previous era that still largely "limited" and "regulated" workers' exploitation were no longer tolerable with capitalism in its current state. The deep crisis in the global economic system makes the bosses “meaner”, urges them to put pressure on their governments to eliminate all that prevents the extraction and realisation of a "fair" profit. By this they mean a profit that is adequate for the current organic composition of capital, for the investment needed to continue the process of accumulation, and the insatiable hunger of an abnormal financial speculation, that not only appropriates a large part of the wealth produced by the working class, but also mortgages the future. In short, behind the war of the bourgeoisie against the proletariat and the social strata closest to it, are not only social factors, but also one of the most serious crises of capitalism, of which the imperialist wars, with their tragic "side effects" such as the flight of millions of human beings in desperate conditions, is “only” the other side of the coin. Welfare is finished, it's time for workfare. In other words, and cutting through bourgeois political gobbledegook, the compulsory levy on deferred (pensions) and indirect wages has to carry on. However less and less of this tax on wages goes to social services (pensions, health, education etc. ), whilst more and more is sucked in by the economic and financial "institutions" of the bourgeoisie, or rather their companies wherever and however they are operating. Subsidies to the unemployed, distributed indiscriminately and almost indefinitely (as the capitalists put it) must be cut: anyone unemployed must disprove the "legitimate" suspicion of being “a shirker” and accept any job, any wage, any hours – although this greatly complicates her/his life and lowers its quality – or risk losing benefits. Even the feeble obstacles to the overwhelming power of the boss in "factory" must be scrapped: whether a sacking is fair or not does not matter in the eyes of bourgeois law; to keep up appearances and in keeping with the dominant logic of the market, peanuts are enough to get rid of those no longer considered fit to lend their labour power to the self-proclaimed business community, especially when the struggle demonstrates the deceit of this "community" founded on exploitation, and therefore on the irreconcilable opposition between exploiters and exploited. Collective agreements now have to take second place to the company (or local, regional ...) agreement because they are more flexible for the needs of business, to adapt more quickly and promptly to the ups and downs of the market in a period of uncertainty. It’s easy to understand how, especially in small companies – the majority, everywhere – where the bosses’ control is more direct, where unionisation is lower (leaving aside any assessment of the trade unions), where in many cases there is no contract. Where it does exist it will be generally worse than the hardly generous national contracts. In addition this will weaken the sense of belonging to a single category (if not class), encouraging the development of selfish and narrow-minded corporatism, less open to solidarity with other workers. In a previous historical period when the class was (by a long chalk) less passive and more inclined, so to speak, to social conflict, collective bargaining appeared in the eyes of the bourgeoisie as the lesser evil. They even accepted it as a useful element in its general economic planning – all the more so if the indices of the rate of profit did not point down. However today the difficulties of the process of accumulation and the substantial class "silence" (partly a product of those difficulties) pushes capital to accelerate its overall attack on the living conditions of the proletariat. The Jobs Act in Italy, "Loi Travail" in France, the Peeters Law in Belgium, and before them all, Thatcherism in the UK and the Hartz IV Law in Germany, just to remind ourselves of some of the stages of this "via dolorosa" of the working class: all point in the same direction. Does the most controversial or, on the contrary, the indispensable central point for French bosses, Article 2 of the "Loi Travail" not resemble certain laws passed by the governments of other countries, which allow exemptions – to worsen conditions – from national contracts? Everywhere law after law, has confirmed and accelerated the general trend to worsen the living and working conditions of the working class. They are written into the DNA of the accumulation process of capitalism, which, having reached a high organic composition of capital, is compelled to put greater emphasis on weapons, wrongly considered by many to be a marginal legacy from capitalism’s past, namely the devaluation of labour power (i.e. lowering wages) and the lengthening (and life) of working time; in short, the extortion of absolute surplus value. From this point of view there is thus nothing surprising about the conduct of the French Government. The same cannot be said for the behaviour of the major (not all) French unions, led by the CGT, given the movement that they have started. This is very different from the behaviour of many other unions; and even of the CGT in previous years. So are we witnessing a radical change in the CGT or the conversion of French trade unionism to a revolutionary perspective? Nothing of the sort of course. The CGT in France has for years been a real institution of the bourgeois state and it wants to remain so. The recent behaviour of the CGT is not so much dictated by greater sensitivity on the part of this union towards the defence of workers interests, but is due, mainly, to two different factors. First: the CGT fears losing important elements of its power in the new law (with all that implies in terms of economic interests). Second: they have to manage the anger of broad sectors of the working class, unwilling to passively accept the reform, and to control the pressures from some segments of class (young and fearing for an uncertain future) ready to mobilise beyond what the CGT itself wants. These two aspects have driven, and somewhat forced, the CGT towards more radical actions, though these go alongside recent statements of opening discussions with the government over its repressive acts towards "out of control" elements. We can count out even more decisively of course, the supposed conversion of the CGT toward any "revolutionary perspective". But such a conclusion applies to all unions. The union by its very nature is the body which bargains over the price of labour power, thus it depends on capitalism, not on its overthrow. The history of trade unionism, and not just in France, confirms this. What politically characterises a struggle, and those who lead it, is the direction that they want to give to this struggle and the unions aim not only for the withdrawal or amendment of the El Khomri law, but for a policy of reforms, perhaps incompatible with the current state of capitalism. Previously in France, there were all-out strikes and vast protest movements (1995, 2006), but, if they temporarily slowed the bourgeois attack (which in itself is no mean achievement), they did not stop it and they sowed very little – to our knowledge – revolutionary class consciousness. The great determination to fight, selflessly launched by the French proletariat, was then, after all is said and done, conducted by the union, just as is happening this time thus far. The union does not mind, in line with its Stalinist tradition, supporting the forces of bourgeois order in the suppression of certain combative and opposition elements within the union itself and in the demonstrations. Of course, we don’t think that everything that is happening is simply the work of a preconceived plan by the union, even though the approval of Article 2 – as we have already said – might cause it problems and weaken it further. There is much social anger and it is growing, but until now it is expressed mostly at the union level, captured and directed by majority unions (CGT, FO) and the so-called alternative union (SUD). Despite the mistrust, despite the disenchantment with trade unionism, this continues to be the reference point of the organised social explosions of anger. The point is that these waves of protest clash with their shrinking room for mediation; It is easy to see that the greater “flexibility” and overall impoverishment of the new working class will accelerate in France, as it has in the rest of Europe, and discouragement, fragmentation, dispersion will follow any defeat. It has become increasingly important for communists to intervene in these kind of situations, supporting the general movement towards the maturation of consciousness of the revolutionary class, to act as a pole of orientation capable of regrouping around the skeleton of an initial revolutionary organisation based on an internationalist perspective. We support the struggle of the French working class, but at the same time, we warn it about trade unionism’s traps, about opportunism both old and new, about petty bourgeois demands, because the only alternative always lies in the final overthrow of the bosses as a whole and a new form of social organisation based on power being in the hands of the workers. The Paris Commune showed us the way forward in 1871. Struggles come and go. Assessing their gains is always difficult but if the working class makes no gains both in organisational terms of class wide bodies like assemblies and strike committees and in political consciousness they do not leave much of a legacy. And, in the inevitable reflux that follows waves of struggle, revolutionaries have to keep alive that political consciousness within the working class, not only disseminating the lessons of the last struggle, but the whole story of the revolutionary movement. They have to make the aim of the construction of the political party of the working class concrete inside these social movements. It is the indispensable tool for concretely reviving the anti-capitalist struggle. It is in these moments that the organisation should and can really mature so that it is strong enough to be able to become a true political party of the class, a body to point the way towards the overthrow the capitalist order: to bring the class struggle from defence of its immediate interests to the affirmation that a new world is possible; to turn the capitalist crisis into the historic possibility of overcoming capitalism itself. This is the political issue in front of us. The Internationalist Communist Tendency works within this perspective of building and developing a revolutionary organisation rooted in the international working class. It is not an easy nor short-term task, of course, but we have to make a start. If you want to do away with this inhuman world: join us!